The product has 42 percent knot strength compared with other competitive products. Seagur took fluorocarbon fishing line to the next level. The product is soft, and perfect shock leader has a weak memory and impressive tensile and knot strength. Low Visibility – Seaguar Blue Label 25 Yards Fluorocarbon Leader is invisible when in water. The product has a design that makes it unable to refract light passing through it. It is therefore, effective when aiming at skittish fish. If a fishing line is visible, fish will always be on the run, making it ineffective. Has a high abrasion resistance- This product has incredible strength making it the best when you want to drag baits along the water bottoms. The product also has limited elasticity making it a sensitive fishing line. The UV resistance exhibited by this product is a plus to the overall product strength. Therefore, when you buy this product, you are assured of durability. Because the product has zero water absorption rate the fishing line, therefore, maintains incredible strength even when in water. 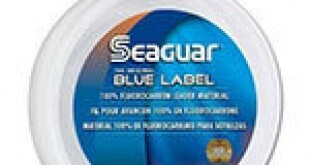 Higher density- Seaguar Blue Label 25 Yards Fluorocarbon Leader manufacturer made sure the product has a high density. You will therefore never struggle to make the fishing line sink. When the fishing line sinks deeper, the bait run deeper reaching even those fish, and creatures that found on the water floor. The material making this fishing line (fluorocarbon) is denser than water; this property reduces the fishing line slack. Also, the inability to absorb water contributes to the overall strength of the fishing line. Higher sensitivity- Seaguar Blue Label 25 Yards Fluorocarbon Leader has fluoro molecules that are packed tightly unlike in the mono. The different style of molecules package makes the fluoro made fishing line, a better energy transmitter that that made of mono. Therefore, there is better information telegraphing from end to end. 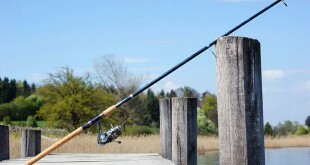 You will therefore quickly know when your bait is touching the floor or even after a light bite. Strong when in water- Apart from the abrasion resistance exhibited by the product, the fishing line is stronger. Even when the sun is hot, the fishing line is not affected like the nylon monofilament. The product is also impervious when used in cold conditions. Seaguar Blue Label 25 Yards Fluorocarbon Leader is also chemical resistant, making it best as it is usable in different waters. The knot strength and the thin diameter eliminate chances of the line breaking when a big creature is caught. 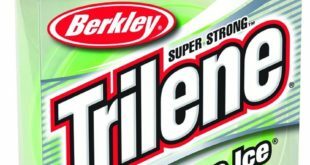 Its sink rate is higher making it less efficient when fishing in the top water. If you are getting a new fishing line whether to upgrade your fishing experience or when starting, and you are confronted with the many brands, I can assure you will never go wrong with Seaguar Blue Label 25 Yards Fluorocarbon Leader. Although you will have to pay more than other brands, the extra bucks are worth sacrificing. If you have been changing fishing line brands, without getting your fishing success elevated, then you just a step away. Go for the Seaguar Blue Label 25 Yards Fluorocarbon Leader, and you will thank me later! Good Luck!